This can be challenging, even if the dog is only a very short distance away. The fact that he is free and moving, makes a big difference. This article is all about crossing the gap, and having fun at the same time. In the past, the gap was breached with force. Especially in the gundog community. Traditionally the dog would be confined in a fairly small space. A pen, run, small garden, even the garage. He would be allowed to ‘mess about’ off lead, near the handler, then the stop whistle is blown. The handler gathers up the dog and returns him unceremoniously to the point where the dog was when the whistle was blown. A small dog would be carried by the scruff, a larger one often dragged. [wp_ad_camp_1]Depending on the level of force used, most dogs accepted this with a reasonable good grace. Especially after the third or fourth time. The dog would then be manipulated into the sit with a further firm whistle command and made to sit there for a moment or two to contemplate the error of his ways. After a few repetitions, he soon decides that sitting is the best course of action whenever the whistle is blown. A considerate and effective trainer will then practice this repeatedly in an area free from distractions and with the dog close at hand, before moving on to a more challenging environment. This is pretty much how we all trained forty years ago. The old methods did and still do work. 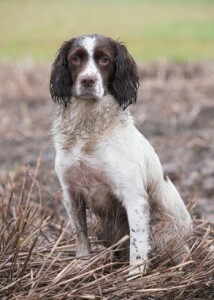 There are gundog handlers all over the country that still train the ‘free sit’ just like this. Problems can arise when someone with insufficient self control or compassion gets hold of the method and escalates the force to the point of abuse. Which is all too easily done. Dogs are very persistent and the method, like any other, requires repetition. The handler can easily become discouraged and tempers can get frayed. Problems also arise when the gundog community and the pet dog community come into contact. Because, put simply, most pet dog owners do not wish to see their dogs treated like this. Even on quite a ‘mild’ level. It can be difficult to get the kind of professional help you are looking for when it comes to stop whistle training. Some old school gundog trainers take the ‘its my way or the highway approach’, either you play their game, or they are not interested in helping you. Often because they simply don’t know any other way to approach the problem. Or because they find it faintly ridiculous that anyone would object to their methods. Some trainers will try and persuade their pet dog owning student to adopt their traditional approach, perhaps moderating the method a little. But the method remains essentially the same: set the dog up to fail, and correct him when he does. If you seek out a professional spaniel trainer, there is a good chance that he may wish to use this approach to getting ’some brakes’ installed into your dog. Aside from the effects on the dog, especially on sensitive dogs, rough treatment of dogs gives gundog trainers a bad name, and alienates people from gundog training. Rough handling on the stop also tends to induce ‘crawling’ where the sensitive dog creeps towards the handler on his belly to attempt to appease him. This can be frustrating for the trainer and can lead to escalating punishment. For all these reasons, I think it is worthwhile looking at more modern methods of stop whistle training. If you want to train quickly and without force, you will need high value rewards. In the early stages food is useful. And no, this won’t mean you will have to cart sackloads of liver sausage around with you when you take your dog shooting. Later on, you will use the retrieve as the rewards. Another reason to ensure your dog is a passionate retriever right from the start. Most of the interim stop whistle exercises on this website use retrieving as a reward. Crossing the vast divide between a dog that will sit to whistle at heel, and one that will sit to whistle at a distance, without rugby tackling your dog to the ground, means breaking the task down into different levels of difficulty. Minimising the dog’s desire or drive to carry on moving, at the point at which the whistle is blown. Get the moving stop right first, with your dog under close control. You can introduce a whistle sit on the move with the dog at heel. Check out this article for more help and a video. Don’t try and skip this. If your dog cannot drop to whistle from a run at your side, he certainly won’t do it when you are twenty yards away. Dogs love to run. All dogs. Especially hunting dogs. Every time you blow the stop whistle, you are fighting this desire to keep moving. To help you in your quest, give yourself an advantage and put the dog into the right frame of mind. Make it so that he wants to stay in the area where you intend to blow the whistle. Make that area appealing to him. For example, if you teach your dog to run to a permanent blind for retrieves, he will become ‘accustomed’ to slowing down and hunting when he reaches your marker. He expects a retrieve and he wants to find it. If you place three dummies out there and send him four times to the marker, on that fourth run, he will stop to hunt for the missing dummy,and you will be in a prime situation to get him to stop on the whistle. If you place your marker up against a fence, and run him to the marker so that his outrun is at right angles to the fence, you limit the dog’s options even further. If your dog does not stop when you try these exercises, bring the whole thing ridiculously close, so that he is just feet away. If he still does not stop, go back and practice some more on your running stop at heel. It isn’t a race, and you’ll get there quicker than you think. Remember that all stop whistle exercises have potential side effects. They can slow down behaviours that you want to be fast (recall, retrieve etc) and they can make a dog overly dependent on the handler and undermine his confidence in himself. So don’t overdo it. Do what you need to do to make sure your dog understands the concept of stopping dead in his tracks, no matter where he may be, and move on. If your dog does not even give you a second glance when you blow the whistle at fairly close quarters, you may have missed out the first and most important stage in stop whistle training: Giving your whistle the ‘feel good factor‘ – check out the link before you go any further. Don’t forget to drop into the forum, where we chat about stop whistles, and all other manner of fascinating gundoggery issues! Tried this today and she’s responding well already! At the moment I am just running, blow the stop whistle and carry on 10/20 yards or so then return to my dog and give her a treat for staying. I have tried stopping her on a recall and she will only stop a few yards away from me when I blow the whistle when she’s 15 or so yards away, I am cautious with this method though as I don’t want to make her hesitant.